Pauline Oliveros is a senior figure in American avant-garde music. Her career spans fifty years of boundary-dissolving music making. Oliveros is as interested in finding new sounds as she is in finding new uses for old ones. 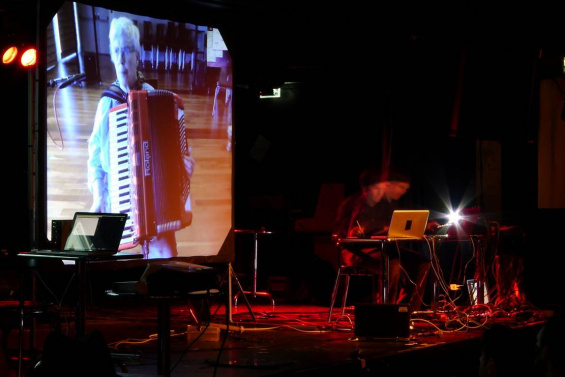 While her primary instrument is the accordion, her compositions and performances explore modes of making and listening to music enabled by technology. Since the 1960s she has influenced American music profoundly through her work with improvisation, meditation, electronic music, myth, and ritual. Recently awarded the John Cage award for 2012 from the Foundation for Contemporary Arts, Oliveros is Distinguished Research Professor of Music at Rensselaer Polytechnic Institute, NY, and Darius Milhaud Artist-in-Residence at Mills College, CA. Doug Van Nort is an experimental musician and music technology researcher whose work explores the interactive sculpting of recorded sound materials and electroacoustic improvisation, often with machine partners. His instruments are custom-built software systems with an ear towards noise, immersion, and free improvisation. Van Nort performs solo as well as in the trio Triple Point with Pauline Oliveros and Jonas Braasch. He also performs with the Composers Inside Electronics and recently with Francisco López, Chris Chafe, Al Margolis, and Judy Dunaway, among many others. His music can be found on the Deep Listening, Pogus, and Zeromoon labels, and he has written for Organised Sound and the Leonardo Music Journal. Van Nort holds advanced degrees in music technology, electronic arts, and pure mathematics, and is currently a research associate at Rensselaer Polytechnic Institute where his main project is FILTER, alongside other related intelligent systems for improvisation. FILTER is the Freely Improvising, Learning, and Transforming Evolutionary Recombination system. Following in the tradition of Pauline Oliveros’s Expanded Instrument System (EIS) and Doug Van Nort’s Granular-feedback Expanded Instrument System (GREIS), FILTER accepts a fellow performers’ sound and re-presents this material in a transformed state over the course of a performance. FILTER advances this area of research by including machine listening and musical structure-learning capabilities in order to create new musical gestures, phrases, and textures based on what it has learned from its partners’ style. As with any sensitive musician, FILTER can mirror its improvising partner or can suggest new musical directions, relative to the given musical context. The development of FILTER has been supported by grants from the CreativeIT initiative of the National Science Foundation.